This lovely flower has been introduced to Japan before the Muromachi period. The pretty face of a woman is compared to this flower (fuyoo no kao 芙蓉の顔). A "peak like the cotton rose" (fuyoo hoo 芙蓉峰) is a poetic way of referring to Mt. Fuji. Click HERE to look at some Fuji Photos ! There are also doubly filled flowers (yae fuyoo　八重芙蓉).
. Look at them on my haiga here . 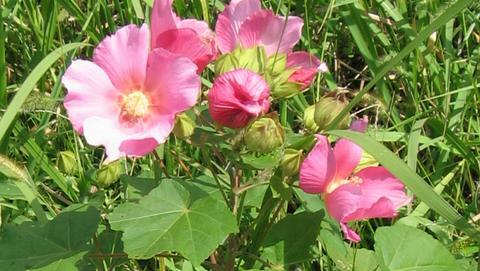 For centuries people have grown these shrubs (Hibiscus mutabilis) for their large, attractive flowers. They bloom from late summer until the first days of winter are near. Unusually, the flowers change color -- starting pure white and then turning to clear pink before finally turning a deep purplish-pink after about three days. In China and Korea, the blooms are valued as herbs, and they are used in infusions or added to various foods. Hibiscus plants are members of the large Malvaceae, or mallow family of plants. Typical of the family, the flowers' many stamens are fused together in a central tube. The leaves are large and woolly as are the sepals that enclose the flower buds. This rough surface helps to protect the plant from predators and also preserves moisture, so that the shrubs can survive periods of drought. In warm climates, the shrubs can grow to a height of 4 meters. Although this hibiscus is originally from southern China, it has become popular in the southern states of America. There, the fluffy seed heads remind people of another famous member of the mallow family, Gossypium spp., otherwise known as the cotton plant. And although it is not a rose, and neither from Dixie, Americans have affectionately named this Oriental shrub the Cotton -- or Confederate -- Rose. 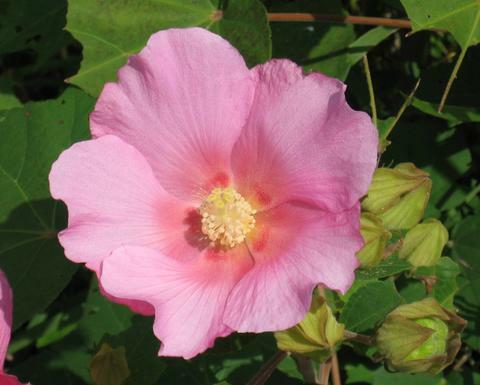 This plant seems similar to the cotton rose. It is often used for prayer ceremonies (pooja). The seed pods are very attractive and used for ikebana and dry flower arrangements. ***** . hibiscus (bussooge 仏桑花) . 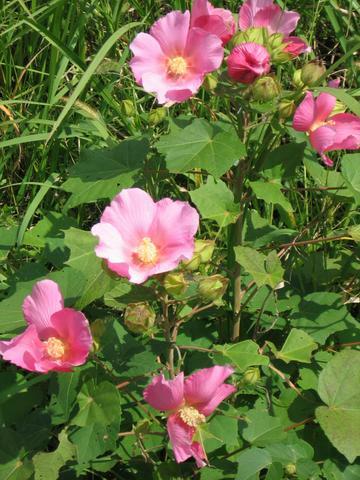 Known as the fuyo in Japan, the cotton rose is a flower elegantly blooming in for only one day in midsummer. With five thin, fragile petals, this white or white-pink flower blossoms only briefly from morning until sunset. Fuyo flowers can be seen in early August in the　garden of the Daruma-dera temple, which is　located in the northwest　of Kyoto City.